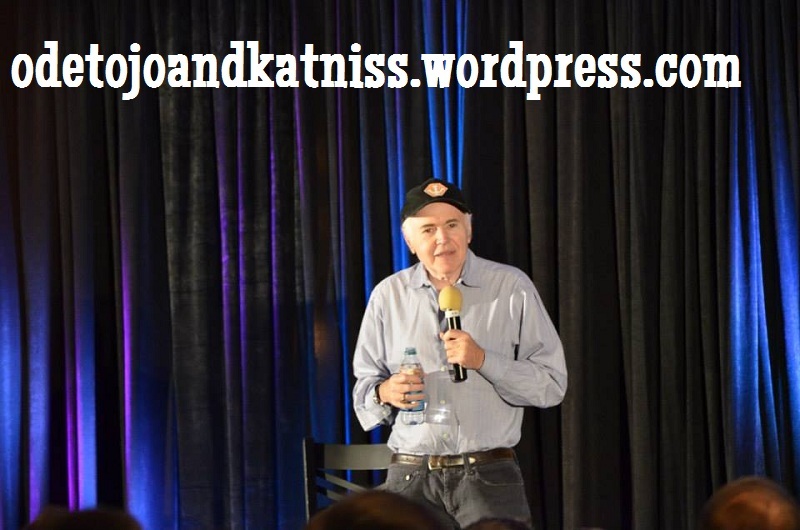 I recently had the chance to attend the Star Trek convention held in Nashville. I went with my husband and two of our friends and we had so much fun! Even though I was more excited about the line-up last year, I ended up enjoying the people who came this year more! The conventions are run by a group called Creation Entertainment, and they have Star Trek and other conventions all over the country throughout the year. This was our third experience with them, though our first year we only attended on Sunday, so we missed the Saturday morning rush. Last year, we experienced it. We got to there at a time we thought was early, only to find ourselves at the back of a really long line, and we ended up missing most of the first guest of the convention, John deLancie, who played Q in The Next Generation, Deep Space Nine, and Voyager. 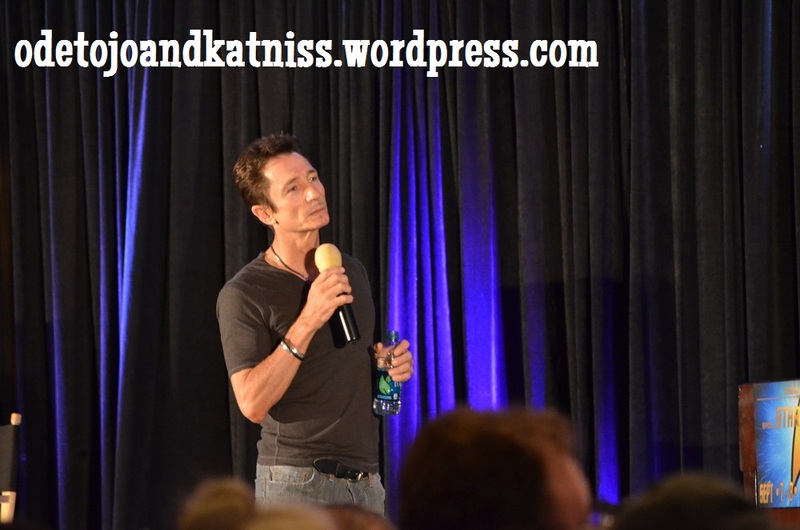 I was determined we not miss the first guest this year, Dominic Keating, so we showed up even earlier. And just like last year, there was no clear signage as to what was going on. There were two lines to the ticket counter, one which was actually going to the ticket counter, and the other we soon realized was at a complete standstill and actually started several yards away from the ticket counter. We were trying to figure out why people were in a line like this, and what line we were in, but didn’t learn much. You see, there were a couple of different packages available for the weekend, as well as general admission tickets. We don’t live too far away, so we went home on Saturday night instead of staying in the hotel, and one of our friends found a good deal for the general admission tickets through Deal Chicken, so needless to say, we just bought general admission. We heard mumblings that we might be in the gold package line, but no real confirmation. Ultimately, my husband stood in the non-moving line, just in case, and the two other guys and I stayed in the moving line. SO GLAD WE DID. I let my guy friends go ahead of me to make sure we were clear to get our tickets, and they were got their tickets processed no problem. So I called my husband to come over STAT, right before I handed the lady both of our tickets for the weekend, and he showed up just in time to get our wristbands for the weekend. We were done before the doors to the big room where all the action happens were opened, so we all congratulated ourselves on working the system. We would find out later that several people did miss Dominic, just like we had missed John last year. Meanwhile, we were first in line to wait to get inside. Others who had gotten their tickets situated were milling about the vendor room or elsewhere, but since we did not have reserved seats, we wanted to make sure we could get in the room ASAP. We had plenty of time so I walked across the hallway to go to the restroom when I suddenly stopped at the sight of Dominic Keating! I was so excited and scurried back over to my husband and friends. “I’m glad I wore the t-shirt, that was quite a hike,” he looked back said to us. TO US! The four of us were just standing there geeking out. Then he disappeared into a room and I flailed my arms as I went back to the restroom (not really, but I might as well have). Later, after I had gotten back to the guys, we saw Chase Masterson, another one of the guests, walking by. She stopped to talked to someone who worked for Creation, looked over to us, and gave us a little wave! One of my friends and I, somewhat belatedly, returned weak oh-my-gosh-did-Chase-Masterson-just-wave-at-us? waves back. Finally we got to go in the room and scouted out the best seats you can get when you don’t have reserved seats, and again, were happy with our success. Then after a while it finally began and out on the stage came Dominic Keating! Dominic Keating played Malcom Reed on Enterprise, and he’s British, so he’s fun to listen to! He was also so funny, spending his time telling us the story of how he got the role of Malcom and answering questions from people in the audience. Something else I also noticed about him right away was how gracious he was to the fans. 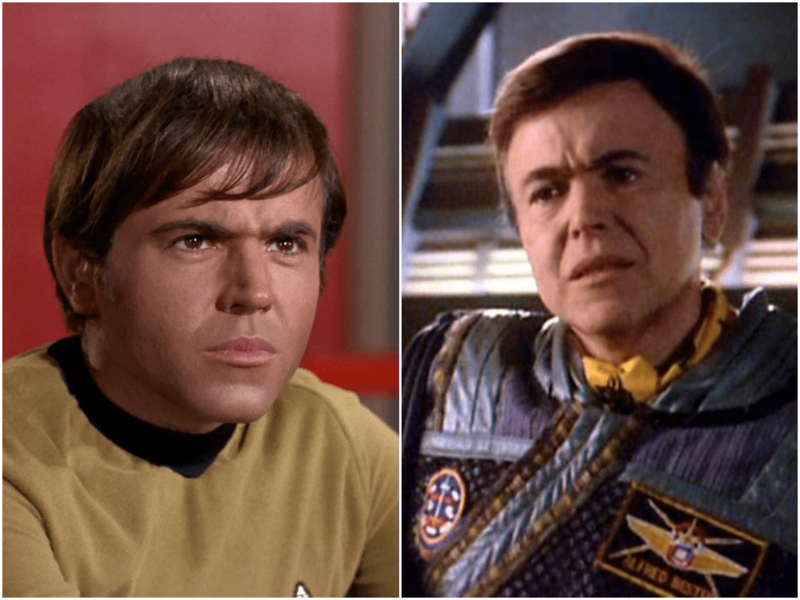 There are some Star Trek actors who are rarely come to conventions because they seem bitter about their Star Trek past, which is so disappointing. But Dominic was very grateful and recognized the importance of fan support, which we all appreciated. 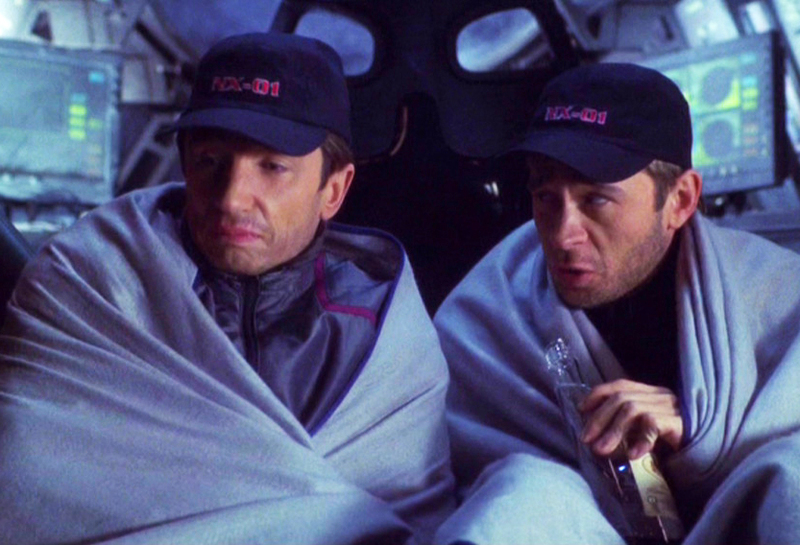 From the episode Shuttlepod One, which might be my favorite season one Enterprise episode. It’s about Malcolm and Tripp getting stuck together, thinking they’re going to die, and annoying each other, ha ha. 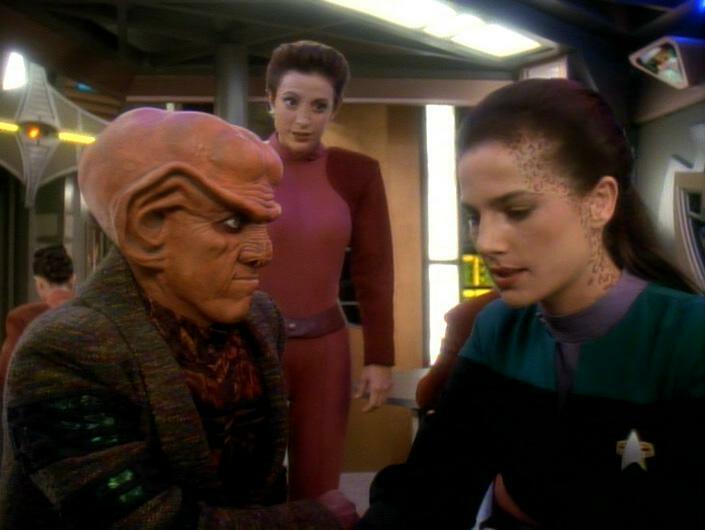 Next was Suzie Plakson, who played a couple of small roles in Star Trek: K’Ehleyr (AKA Worf’s girlfriend) on The Next Generation and the female Q on Voyager. She was mostly there for a makeup artist to do a demonstration of Klingon makeup on her. But first, she told us she wanted to sing us a few songs. This is something I have noticed is common among Star Trek actors… they want to sing for us. This year I couldn’t help but wonder if it’s because we’re in Nashville and the Grand Ole Opry was literally right next door. But regardless, she started singing, and we decided to leave after a couple of songs, because it was the best time for lunch (the scheduled lunch break wasn’t until about 2) and we weren’t interested in more singing or the make-up. So after our lunch, we were thankfully able to still to sit in the same area as before and waited for Chase Masterson. Chase played Leeta on Deep Space Nine, and my husband and I had seen her last year. We were happy to see her again this year because she is super sweet. She also clearly loves her fans, and people in general really. She works with several charity organizations and her congenial disposition shines through. Chase sang for us too, which was expected after last year. Next was the scheduled lunch break, during which one of the guys stood in line for Walter Koeing’s autograph, while my husband and our other friend decided they needed some coffee. Since I don’t drink coffee, I got some frozen yogurt, just for fun. We walked around and chatted, hit up the vendor room, and then it was time for Terry Ferrell, who played Jadzia Dax on Deep Space Nine. I was super excited to see her as she was one of my favorites on the show. We got to see Quark and Kira too; more about that next time! There was a little bit of down time with trivia games and such, and then it was time for Walter Koeing, who played Checkov from The Original Series! I have to admit that when I heard Walter Koeing was coming, I was more excited about it because of his role as Bester on Babylon 5 than that of Star Trek. I know it may sound blasphemous coming from a Trekkie, but seriously, BESTER ON BABYLON 5!!! He was awesome at being evil. And Walter actually flat out said that he was his favorite TV character he played. Anyhow, it was neat to see him. And then that was it for the day, at least for us! Sadly, we had to miss the karaoke party hosted by Dominic and Garrett. That was probably some seriously fun times. But unfortunately, it was going to be too late of a night for us, so we went out for dinner, went home, and then hit the sack so that we could be ready for Day #2! Have you ever been to a Star Trek convention? Who of these Star Trek actors would you be most excited to see? It sounds like you had SUCH a great time! I’m dying to go to a Star Trek convention someday! I would have been pretty excited to see Dominic Keating. Enterprise is actually one of my favorite Star Trek series. Enterprise is my second favorite, after Deep Space Nine. I would really love to see Connor Trineer because Trip is my favorite Enterprise character. I did get to see Tuvok, so you’ll hear more about that! I would LOVE to see Data! I hear Brent Spiner is hilarious! I would enjoy Jeri Ryan too. It sounds like you totally enjoyed your inner nerd, while I sit here and feel that I can’t relate to your post. Hehe.